The 6th Floor of the Critical Care Wing at the General Campus has been officially named the "Sinclair Centre for Regenerative Medicine." The new name honours Bill and Joyce Sinclair, Ottawa philanthropists who have committed generous support to the Regenerative Medicine Program at the Ottawa Hospital Research Institute. 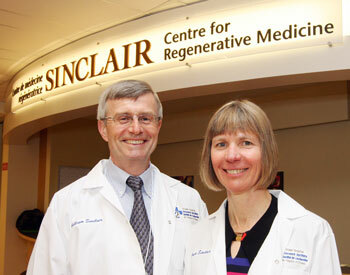 The Sinclair Centre for Regenerative Medicine houses the laboratories of Drs. Duncan Stewart, David Courtman, Catherine Tsilfidis and Bernard Thébaud, as well as a GMP cell manufacturing facility. The new name was unveiled at a reception that included remarks by: Dr. Jack Kitts, President and CEO of The Ottawa Hospital; Tim Kluke, President and CEO of The Ottawa Hospital Foundation; and Dr. Duncan Stewart, CEO of the Research Institute. Following the unveiling of the centre’s new name, the Sinclairs and invited guests toured the laboratories and saw firsthand some of the groundbreaking research being conducted on the floor.